As the holiday season officially kicks off, Borsheims and our makers want to continue providing our customers with unique shopping experiences to take some of the pressure off of holiday shopping. One such maker is Mary Jo Pane of Miracle Icons. 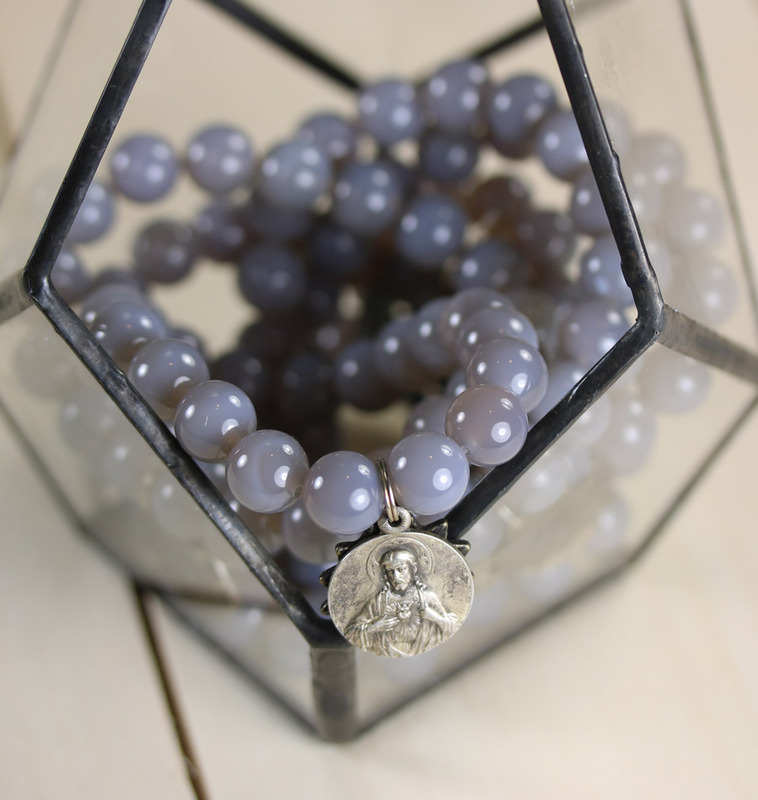 Each year over the Thanksgiving/Black Friday weekend Mary Jo, an Omaha native, comes back to Borsheims to create custom Miracle Icons bracelets and necklaces, perfect for gifting or receiving a bit of spiritual support during the season. 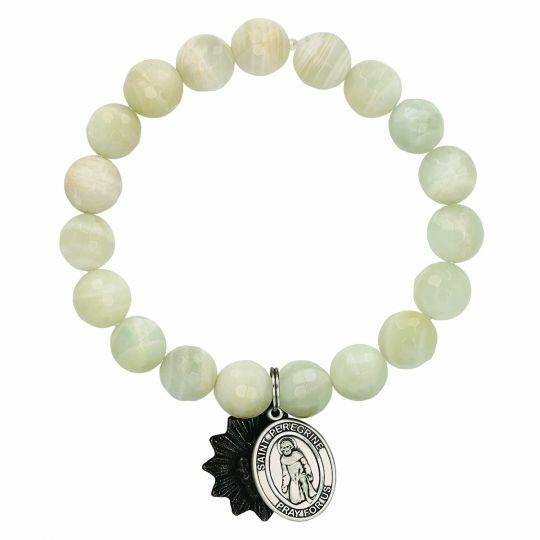 In 2001, Pane taught herself how to make necklaces and bracelets, incorporating saint medallions similar to those she had as a child. 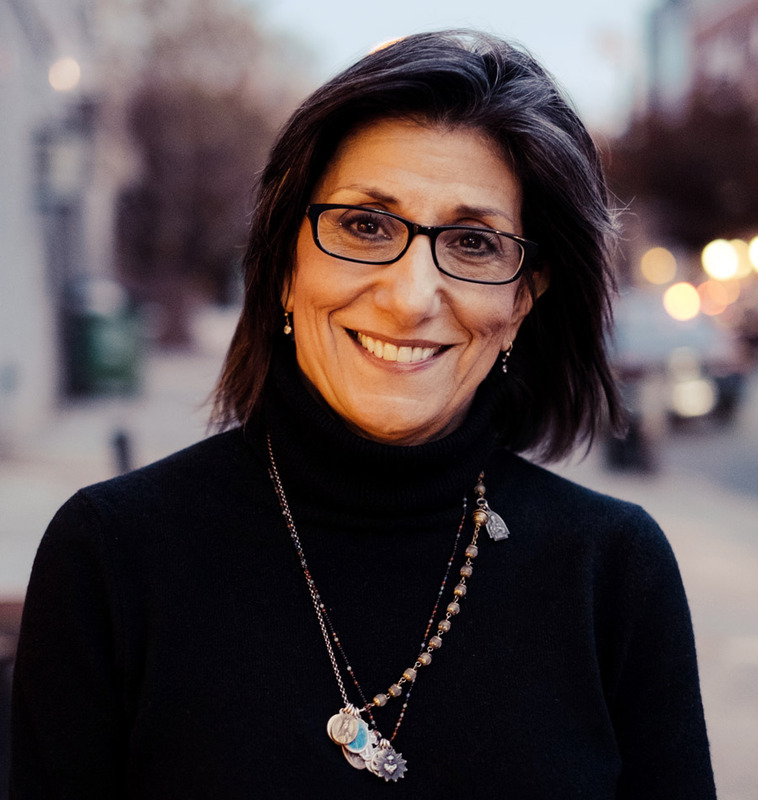 Inspired by a friend in New York City who was battling stage four inoperable lung cancer, Mary Jo gifted her a St. Anthony medal to wear as a talisman during treatment. Five years later, her friend was deemed cancer-free. This and other experiences reinforced Pane’s beliefs in miracles and the Miracle Icons brand was born. We interviewed MJ to learn more about her design inspiration, saint story, favorite project and more, ahead of her Miracle Icons custom trunk show November 23rd – 25th here at Borsheims. What was the transition like from working in the fashion industry to starting your own business? 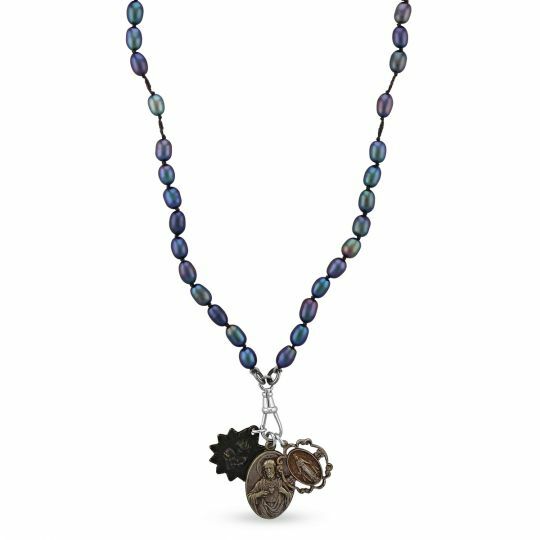 There really wasn’t much of a transition since I was drawing on my experience and connections within the industry I knew to learn the craft of making jewelry and stores I worked with to carry the product. St Philomena because of my mother’s name. And St Rita who I have come to know through my work, she is the feminist St Jude. Where is your favorite place to visit and get inspired? Walking streets of NY and looking at kids on street, museums, magazines and runway show videos. 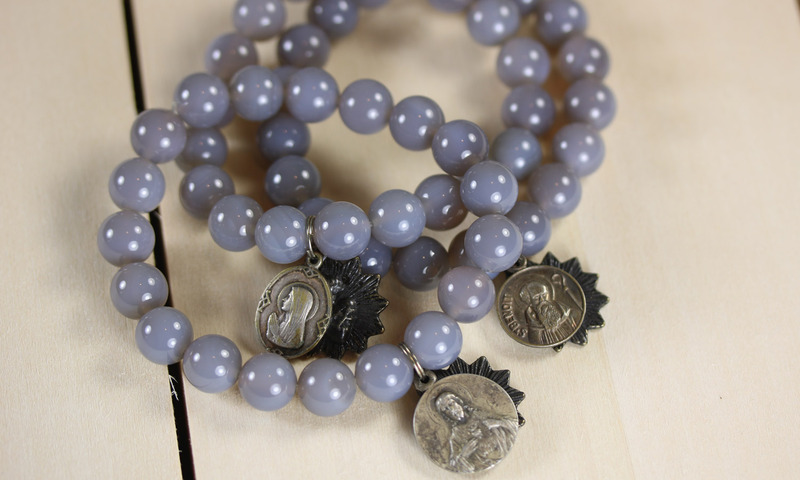 Your jewelry is a mix of quality semi-precious beads and vintage medals. Is this same “old meets new” aesthetic present in your own life? 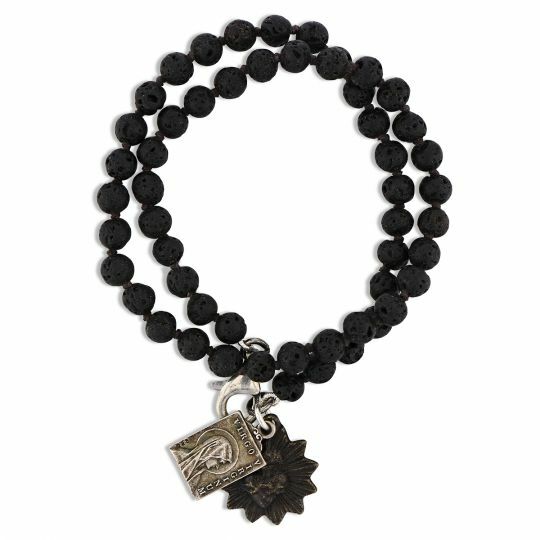 Have you ever experimented with other materials for your bracelets and necklaces? All the time. In the past I made some bracelets using velvet ruffles — sounds weird right? They were actually pretty cool, but not the easiest to produce. What has been your favorite custom project? Who was it for? Probably a necklace for Bruce Springsteen that I actually got to give to him personally. Making a necklace for Matthew McConaughey to wear in” Failure to Launch,” he is a sweet man, sent me autographed photo inscribed “Viva Los Santos” and then had me make several gifts for his friends, one being Jake Gyllenhaal who then requested a necklace to wear in his next movie. What’s a day with Mary Jo Pane & Miracle Icons look like? Go to the gym, gather whatever supplies I might need from vendors and making jewelry. Dries Van Noten, Prada, John Galiano’s current guys. Old school Channel (herself), Schiaparelli, Madam Gris…I could go on and on there, but those are my favorites. Finally what sums up Miracle Icons, the brand and the philosophy? Miracle Icons resonate with an evolved worldview, an openness to possibilities beyond intellectual understanding and with a sense of spirit that transcends specific religious beliefs. I have never felt this product is exclusively Catholic. Borsheims is excited to welcome artist and designer Mary Jo Pane to our store for her custom trunk show November 23rd – 25th. 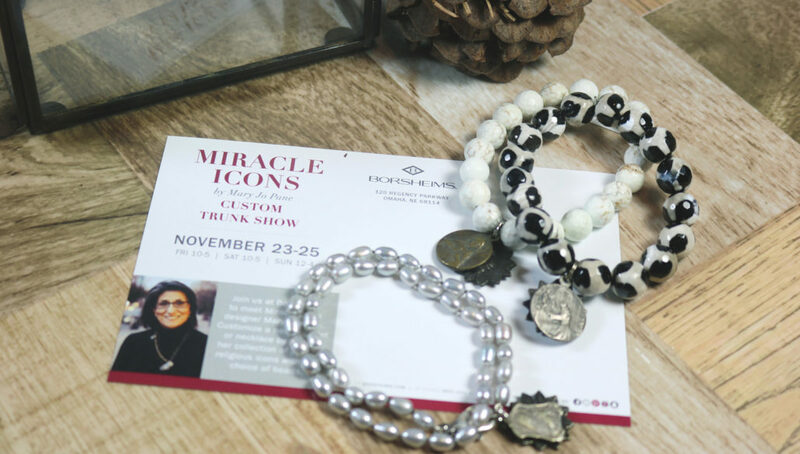 Guests will get to meet Mary Jo and create their own Miracle Icons bracelets and necklaces with her help, perfect for holiday gifting.